Finding engagement rings in Dallas Texas is not difficult. As one of the largest cities in the state with well over one million residents, there is a wide range of jewelry options available for couples searching for the perfect ring. The Dallas city motto is "Live Large. Think Big." With the Lone Star State having a reputation as being vibrant and larger-than-life, choosing a hefty carat weight ring is a good way to show Texas spirit and diamond sparkle. The state's large Hispanic culture and Native American history can also influence the style of engagement rings with unique filigree patterns, different types of semi-precious gemstones (turquoise is particularly popular for Native American designs), and other details. Yet another option is to choose an engagement ring with the official Texas state gem, topaz. Couples who truly want a Dallas style ring may opt for even more specific designs. The Caddo tribe originally settled the Dallas region, and finding a ring with tribal influences offers a unique connection to the city. Dallas is also home to numerous professional sports teams, including the Dallas Cowboys NFL team and the Dallas Stars NHL team, and custom engagement rings could be designed with team colors, logos, or other symbols to highlight Dallas. Sports fans, in particular, may appreciate a replica Super Bowl ring, perhaps even paired with a Super Bowl marriage proposal. The Dallas area is also very religious and has significant populations of Protestant, Latter Day Saint, Methodist, Baptist, Catholic, and other Christian faiths, making Christian rings particularly popular. The large Jewish population also makes Jewish engagement rings sought after. Diamond and Gold Warehouse: Engagement rings as well as loose diamonds with wholesale prices. Additional diamond jewelry and gemstone pieces available. The Diamond Broker: More than $2 million worth of diamond jewelry in stock, including a stunning collection of semi mount diamond engagement rings for a couple to customize. Shapiro Diamonds: This loose diamond and design studio specializes in GIA certified diamonds and other high quality pieces. Mariloff Diamond: This jeweler offers bridal set engagement rings, loose diamonds, wedding bands, and other gorgeous jewelry at the Dallas showroom. Maroon Diamonds: Specializing in GIA diamonds with certified gemologists on staff. Loose diamonds and rings available. Saffron Jewelry: Designer jeweler with more than 20 years experience crafting yellow and white gold rings and other diamond jewelry. If couples have trouble finding just the right engagement rings in Dallas Texas, they can shop for online engagement rings from jewelers based anywhere in the world. Short trips to nearby cities such as Austin and Houston can also yield different types of jewelry, or couples could visit Las Vegas, New York, Los Angeles, or other notable destinations for fine jewelry. Before purchasing a ring, couples should always investigate the diamond quality as well as the ring's craftsmanship and the retailer's reputation. While bigger rings may be more desirable in Texas, a bigger gemstone is not always a better one and understanding how to judge the overall quality of a ring can help a couple select one that will suit their preferences and their budget.The Texas climate can also influence the type of ring a couple should choose. The extreme summer heat can cause fingers to swell and sweat, and finding the appropriate ring size is critical for comfort. 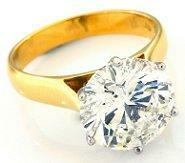 Split shank rings or thinner rings that are less bulky on the finger may also be more desirable. There are thousands of engagement rings in Dallas Texas that couples can choose from, whether they are interested in a true Texas ring or just a lovely ring to symbolize their larger-than-life commitment.